The content of this article provides interesting history, facts and information about Praetorian Guard. The Praetorian Guard were established by the Emperor Augustus Caesar the first Roman Emperor. As Octavian the nephew of Julius Caesar he had seen the assassination of his uncle and realised that a position of power required, such as the emperor, required bodyguards. He therefore selected elite, experienced Roman Soldiers to serve in this capacity. The name 'Praetorian Guard' originated from the 'Praetoria Cohors' who were the troops who guarded the Praetor and then the Consuls who served as commanders in a military capacity. The Praetorian Guard were a large entity mirroring the structure and number of soldiers in a legion. There were ten cohorts consisting of about 500 soldiers in each. Emperor Augustus stationed three of the cohorts in Rome and the other cohorts of the Praetorian guard were stationed in Italy but outside the cit of Rome. Near enough to call upon if necessary and far enough away so as not to alarm the Romans with the numbers involved in the Emperors personal military force. Their number was increased by the Emperor Vitellius to sixteen cohorts. The commanders of the Praetorian Guard were called praefectus praetorio. The power of Praetorian Guard was immense. These were the best and bravest soldiers. Well paid and able to reside in the palaces of the emperor they were the elite members of the military. Their power led to corruption. Leading members of the Praetorian Guard gradually began to exercise their political power. Roman Emperors were raised and deposed at their will. There are several examples of the extent of their power. Nero was finally dethroned by the Praetorian Guards. The Emperor Claudius was raised to the throne by the Praetorian Guard. Co-emperors Balbinus and Pupienus were assassinated on the same day by soldiers of the Praetorian guard. They proclaimed Marcus Aurelius Carus, commander of the Praetorian Guard, as the new emperor and put the previous emperor Probus to death in September A.D. 282. The Praetorian guard murdered the Emperor Pertinax and then proclaimed from the ramparts of their camp that the throne of the world would be sold at auction to the highest bidder. Didius Julianus, offered about a huge bribe to each man for the possession of the prize and was declared emperor. The Emperor Tiberius created the Praetorian Camp (Castra Praetoria) located in the eastern suburbs of Rome. Tiberius appointed Lucius Aelius Sejanus commander of the Praetorian Guard (praefectus praetorio). Tiberius trusted Sejanus who became so powerful that he was left to govern Rome. Eventually Tiberius realised that Sejanus and his terror tactics had become so powerful that he himself was at risk. Tiberius denounced Sejanus as a traitor. Sejanus was flung into the Mamertine Prison and there he was strangled in 31AD. The Emperor Constantine the Great disbanded the Praetorian Guards and their role was never revived again. 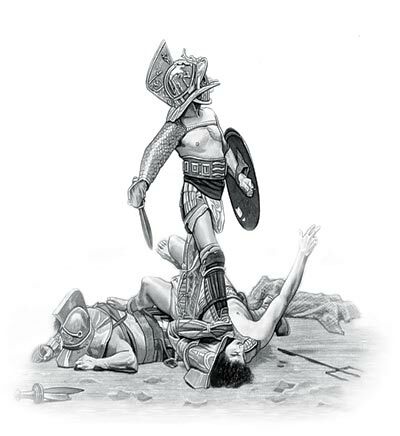 The content of this Praetorian Guard category provides free educational details, facts and information for reference and research for schools, colleges and homework. Refer to the Colosseum Sitemap for a comprehensive search on interesting different categories containing the history, facts and information about Ancient Rome.